SPAL designs and manufacturers sealed DC brush and brushless motor electric cooling fans and blowers for OEM automotive, bus, truck, off-highway, construction, powersports, military, marine, and the stationary equipment (generator/APU) markets. The products are used for cooling radiators, oil and transmission coolers, condensers, evaporators, heaters, CACs, batteries (hybrid and EV applications), and for ventilation. Additionally, SPAL offers various automotive-related accessories to support the racing, motorsport, installer, speed shop, and the DIY markets, both amateur and professional. SPAL had become a Business Automation Specialists of Minnesota (BASM) client to support their Sage PRO software needs. When news that the platform their software was built on would no longer be supported by Microsoft, SPAL looked to BASM for a replacement. 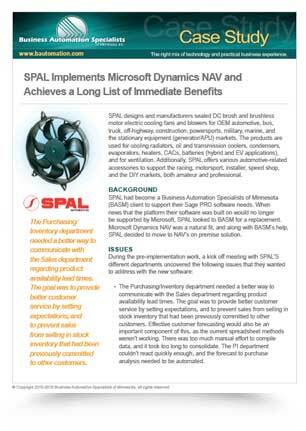 Microsoft Dynamics NAV was a natural fit, and along with BASM’s help, SPAL decided to move to NAV’s on premise solution. The Purchasing/Inventory department needed a better way to communicate with the Sales department regarding product availability lead times. The goal was to provide better customer service by setting expectations, and to prevent sales from selling in stock inventory that had been previously committed to other customers. Effective customer forecasting would also be an important component of this, as the current spreadsheet methods weren’t working. There was too much manual effort to compile data, and it took too long to consolidate. The PI department couldn’t react quickly enough, and the forecast to purchase analysis needed to be automated. Warehouse and Shipping had an integration between their WMS and accounting solutions, but it wasn’t effective due to two separate databases. They didn’t have the control to make it responsive to their requirements, although they had created many workarounds to make it work. They also needed better visibility into inventory, and needed real-time reporting, which would require fixing their process of using quotes instead of sales orders, without releasing inventory prematurely. Additionally, their production modifications required duplicate data entry between their systems which were prone to data entry errors. A third solution for shipping, with a poor integration, caused delays in updates. Finally, shipping containers received from their parent company in Italy, contained multiple purchase orders in the same container. They needed a container receiving and tracking module with the ability to send and receive data into their ERP system to update the PO automatically. The Accounting / AR / AP group needed a way to automate the allocation and billing of landed costs, which was delaying receiving while manual calculations were done, which caused delays throughout the organization. They also needed a streamlined process for meeting their parent company’s requirements for reporting and financial statements. Management spent too much time compiling data, which didn’t leave time to analyze it. It also required going to each department to get it. There was no centralized system or visibility into the data otherwise. Management” module designed by BASM. The Container Management module cut receiving time to less than half. What had previously taken SPAL 45 minutes using spreadsheets is now received and automatically reconciled and allocated to the warehouse in 20 minutes. It also improves accuracy and time frames due to the landed cost and volume modification. CSR’s can now see immediate availability of inventory and it has reduced administration time, so now purchasing agents can update statuses without having to go to each purchase order. One of the most complex implementations involved the WMS, Webstore, and Labeling functions. With no way to do a phased implementation, it all had to go live at once, but that went without a hitch due to preplanning and project management. The SPAL team got what they were looking for and more. Each department enthusiastically embraced the changes and benefits they could see immediately. The CSR’s loved all the information they could find and the visibility regarding status of orders once they were released to the warehouse. After seeing the first check run, AP was “giddy and looking for other things to do” according to the AP manager. The warehouse manager loved the new shipping station with scanner. The front office loves the visibility into all the other departments. Both the BASM and SPAL teams worked to pull it all together and get it done. After the first week they were feeling comfortable with where they were in the implementation, using the new system, and the long term time savings, streamlining, reporting, accuracy, reporting and ultimate customer satisfaction the solution would provide.